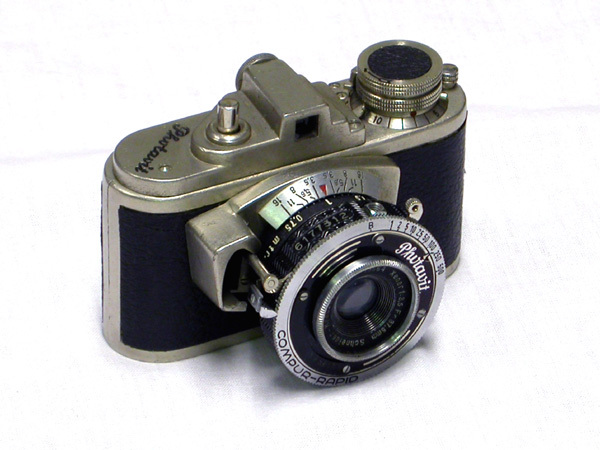 1938 Photavit Model II with Compur-Rapid shutter with an f3.5, 37.5mm Schnieder-Krueznach Xenar lens. Takes 24mm x 24mm exposures on 35mm film in special cartridges with Bolta size spools. No rewind, film advances from one cartridge to another. Viewfinder only, no rangefinder. Advertised as the smallest 35mm camera made.